"what the brochure doesn't tell you a visit will"
Since the 1850's golf course architects have always had a sense of drama in their designs. The Old Course, St Andrews with double greens, to a Hole named "Calamity" at Portrush and what seems a very innocuous pond in front of the 17th green at Valderrama in Spain. Scotland for Golf are delighted to offer a variety of Golf Vacations even if the name suggests otherwise. Where it all began in the 14th Century. 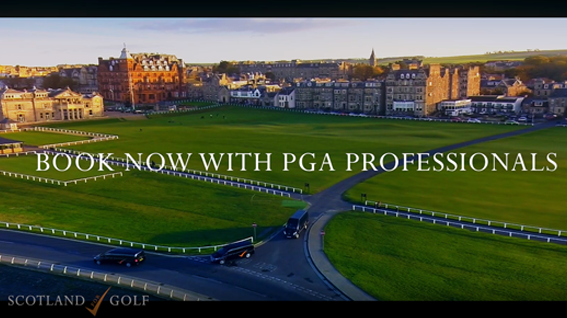 Now a global sport with visitors from all corners of globe making the pilgrimage to play the famous "Links Courses of Scotland"
Based at the Home of Golf, in the town St Andrews, with our experienced team of tour coordinators and P.G.A. Professionals we are confident that your golfing trip to Scotland will be an amazing experience!